Coral building stone at the Princess Mtoni Ruins, Zanzibar. This week I’m continuing with sharing some pictures from my recent vacation in Zanzibar back in June 2013. There is plenty of coral around Zanzibar, and my husband and I noticed that many of Zanzibar’s buildings– both ancient and modern– have been built with coral blocks. As an example, the picture above shows a coral building stone in the Princess Mtoni Ruins, the remains of the childhood home of Princess Salme, a Zanzibari princess who in the 1860s eloped with a German merchant, converted to Christianity, and changed her name to Emily Ruete. While living in Germany, Emily / Princess Salme wrote an excellent book about her life: Memoirs of an Arabian Princess from Zanzibar. I read the book while I was in Zanzibar and highly recommend it. The book provides a rare, rich, colorful glimpse of Zanzibar– or at least of Zanzibari royal life– in the mid-1800s. 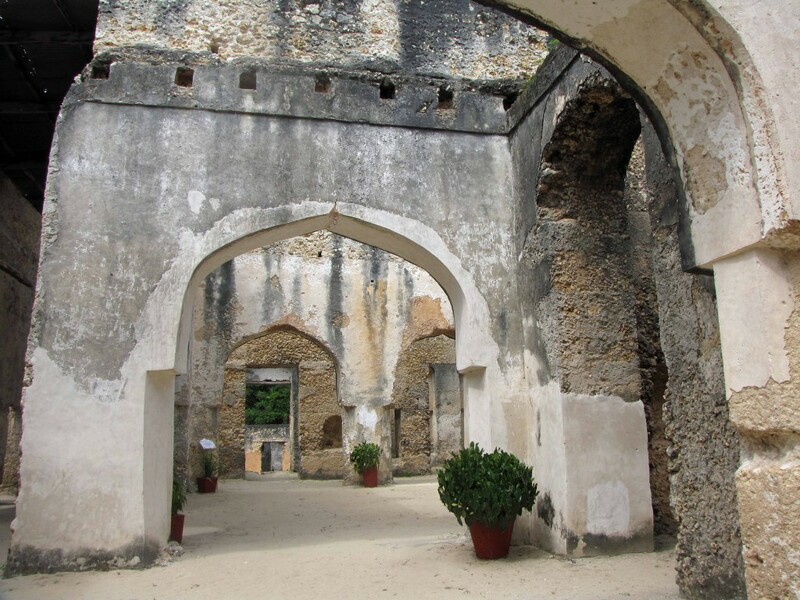 My husband and I visited the Mtoni Palace Ruins one morning on our way to Stone Town. We spent half and hour or so strolling through the ruins. Much of the Mtoni Palace that Princess Salme described in her memoirs has been destroyed or is in ruins, but the seaside palace is still definitely worth a visit. There are some interesting baths and toilets, and there are some beautiful arched doorways. I believe that much of the palace is constructed out of coral rock. Our guide pointing out a picture of Princess Salme and her family. Princess Salme, her German husband, and two of their children. Yours truly posing by the palace entrance. Beautiful arched doorways / passageways. My husband Jackie and our tour guide strolling through the ruins. Windows with a view of the sea. Top of a stone wall. More windows with a view of the sea. The view through one palace window. A lone palm leaf resting in a coral alcove. Yours truly posing with a coral wall.